In Apex Legends, it is important to land earlier than the other rival players. This will give you a chance to collect better gear and weapons. On the other hand, if your opponents landed first, they’ll get the loot and wait your arrival with loaded weapons. Therefore, reaching the ground before anyone else is vital in Apex Legends. After jump off the ship, go straight down and keep an eye on the speed indicator on the left. 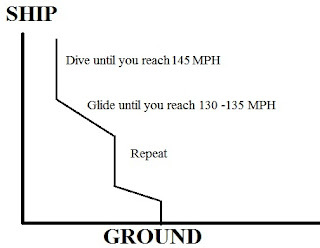 Stay in the drop until you reach 145 MPH. Then you go into a slightly oblique glide until the speed drops to about 130 - 135 MPH. Then go back into the drop until the speed is 145 MPH again. Then glide again. 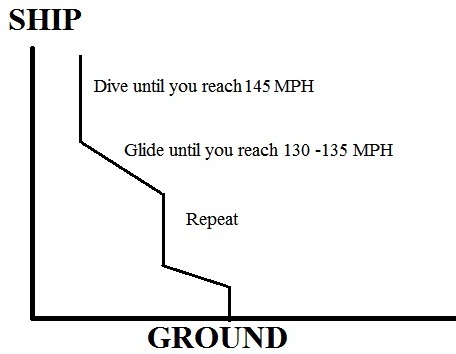 Repeat this process until you reach the desired landing spot. When Should You Jump Off the Ship? You dive approximately when the ship has covered half the distance from the start to the landing spot. If the landing location is far away from the course of the ship, then wait until the ship is about to be at a 90-degree angle to the landing spot and then jump off.